All American BBQ: Everything you love about barbecue is here: molasses from Memphis, tangy tomato from Kansas, mustard, pepper, and vinegar from the Carolinas; and a wisp of smoke and chipotle from Texas. More than infatuation, this is true barbecue love! Lip-smacking good on ribs, chicken, corn-on-the-cob, and if you like ketchup on your eggs, try a sprinkle of All American Barbecue instead. Ginger Teriyaki: Savor the harmony and balance of sweet teriyaki and fragrant shoga (ginger). Renowned for centuries for its tingly flavor and mythic love-enhancing quality, ginger lends exotic taste to this modern teriyaki interpretation. Most auspicious (and delicious) on chicken, shrimp, and steak. Hickory & Molasses: Deep, rich molassess. Not too sweet. Tangos on your tongue with natural hickory grilled flavor. Pair this award winning twosome with pork (chops, roasts, or tenderloin), chicken, turkey, even green beans for smoky, low fat flavor. Original Hickory Grilled: Rich, hickory grilled flavor. This classy companion to your favorite steak is the original used at Al Farber’s legendary steakhouse. A bit smoky-salty-sweet, it enhances the natural flavor without overwhelming. Also delicious on boneless/skinless chicken breasts, tuna steaks, and your favorite vegetables. 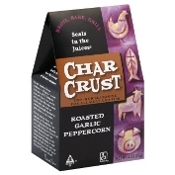 Roasted Garlic Peppercorn: Savory roasted garlic and fresh cracked peppercorns make music in your mouth. With added lilt of worcestershire and lavender, this symphonic sensation creates a crescendo of flavor with steak, lamb, fish (especially salmon), and roasted potatoes. Southwest Chipotle: You inhale the heady aroma. Take your first bite: smoky, rich, almost sweet… then BANG! The kick of ancho and chipotle chiles from New Mexico leaves no doubt that this is the taste of the real southwest. Enjoy with chicken, pork, beef.